Visible light is part of the electromagnetic spectrum. As you can see from the diagram it represents a very small part of this spectrum but is responsible for our sight, our color vision and our circadian rhythm. It is made up of all the colors of the rainbow, where the violet and blue light (shortest wavelengths) has the highest amount of energy. The energy of each wavelength decreases as the wavelengths get longer where longest red light wavelengths have the lowest amount of energy in the visible spectrum. Visible light with the highest amount of energy (blue light) can damage your macula and fovea over your lifetime if not protected and will degrade your visual performance even when young and healthy. 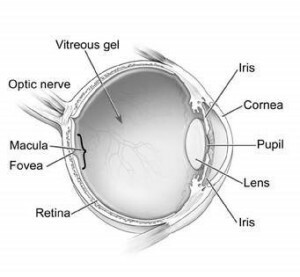 What are the Retina, Macula and Fovea? Our retina is located at the back of the eye and acts similar to the film in a camera. It receives signals from visible light entering the eye that are collected by photo-receptor cells called rods and cones. These signals are relayed through the thalamus to the visual cortex where they are processed and converted into an image. This process happens in milliseconds and the result is our precious gift of sight. Rods are located in the peripheral retina, are very sensitive to light and movement and are used for our peripheral vision. They are activated in low-light conditions such as in dimly lit restaurants and at night when outside in the dark. For example, have you ever looked directly at a star at night, and the star disappears? When you look just away from the star it reappears. When this happens you are moving your line of sight from your central vision (cones) to your peripheral vision (rods) and the star reappears. Vision with our rods is in black and white. Rods do not provide color vision. Cones are used for our most critical, central vision. They are highly concentrated in a small area of the retina called the macula with the highest concentrated in the center of the macula called the fovea. We use our cones for all of our central vision, color vision, reading and anytime we look directly at an object or someone’s face. Since the cones in our macula and fovea are responsible for our most critical vision, they are constantly being bombarded with visible light including light from the blue end of the visible light spectrum. Blue light does not activate our cones and therefore is not important for our critical central vision. Since blue light is highest in energy of all visible light, it creates photo-oxidative stress and free radicals at the macula. Over time this stress damages the cones and the retinal pigment epithelium resulting in central blindness called age-related macular degeneration. This is a very gradual process over our lifetime, like rusting of a car left in the field for many years. Macular pigment is nature’s way of protecting our macula and fovea over our lifetime from the damaging effects of blue light. Did you know that the Macula and Fovea have the highest metabolic rate of any tissue in the body?